There's a grassroots movement going on in the twittersphere to amend HR policy to include power naps. You know, to calm the crankies. One simply innocuous tweet about having just taken a nap spurred a hashtagged thread of conversation that got me thinking..
You've heard the stories about employees "caught" napping on company time. Everything from being laughed at to a verbal lashing or actual administrative discipline ensue. But, HRecruiting Alert recently reported on Pew research indicating that 33% of those earning six figures nap regularly on the clock. And apparently there is a whole niche industry around the practice. There's a PowerNap NapMachine which touts 3 hours of deep sleep in just 20 minutes and a Power Nap Kit with versions for teens, college students and adults. What about the time honored Latin American tradition of the siesta? It's actually a pretty cool concept. Work days are split into 2 parts with a 2 hour break in the middle. Go home, have lunch, take a nap, see your family.... Of course it might not work well for long distance commuters. But, progressive companies could have quiet rooms. According to the National Sleep Foundation, "more than 85% of mammalian species are polyphasic sleepers, meaning that they sleep for short periods throughout the day. Humans are part of the minority of monophasic sleepers, meaning that our days are divided into two distinct periods, one for sleep and one for wakefulness." They go on to say that it's is not clear that this is the natural sleep pattern of humans. I don't put myself above other mammals, especially when it comes to napping. What about the stigmas attached to napping like laziness, a lack of ambition, and low standards or that it's only for children, the sick and the elderly? With a whole foundation that recognizes the benefits it seems that napping just needs a better PR campaign. Some of todays employers permit napping at work. More than one third of Americans (34%) say that their workplace permits napping during breaks at work, with 16 percent reporting that their employer even provides a place for them to nap. An additional 26 percent say they would nap on a break at work if their employer were to allow it. If you work in one of the 66% of workplaces that don't permit napping on the clock I want to help. Here's a sample Workplace Napping Policy I devised. It can be customized to meet the needs of your workplace. If you're not in a position to implement company policy you can forward this post to whomever is and request they review it for consideration in your workplace. Workplace napping is a company benefit that recognizes that similar to diet and exercise, sleep needs to be an integral element of a healthy lifestyle. The impact of not getting good sleep is far reaching and has Americans compromising their productivity, safety, health and relationships both on the job and at home. Employees are provided the opportunity to nap during work hours on their paid break without fear of being stigmatized as lazy, unambitious or lacking in standards. Napping is permitted in areas where the work of others will not be affected such as private offices, break areas and quiet rooms. It is the responsibility of employees to monitor their nap time via personal alarms to ensure they do not go over their allotted break time. If you don't now how to power nap wikiHow offers some great tips. National Napping Day is each year the Monday after Daylight Savings kicks in. It will be celebrated March 9, 2010. Is napping allowed where you work? if not, how do you manage to nap when you need it? If I were to nap, I couldn't sleep well at night. But I really hate the time change we go through each year, can we do something about that? If one could only get to the bottom of who is behind this…….. It's obviously some old rule that needs to change. adowling – I say yes to sleeping bags as end of year gifts. You want me to amend the official #powernapsrule policy? adowling – I say yes to sleeping bags as end of year gifts. Yo want me to amend the official #powernapsrule policy? Today I was exhausted, I mean absolutely zonked. All the holiday parties, football games, late night television had taken its toll, and today was the day: I knew I had to have a nap. Not just any nap mind you, I had to have a #powernapsrule kind of nap. The reason I like this post so much is that it validates the virtues of napping, its restorative powers, and it validates the occasional need to nap breaks at work. I think what would be fun is to come back to this post weekly, and report about my nap. Today's nap was a bit light. I was listening to my favorite music. I like napping with music in the background. I find it soothing. Then I like to switch the songs out when I'm waking up, to pep me up. For instance, after today's snooze, I tuned on my favorite popular song, “Tik Tok,” by Keisha. That is my happy song, and it makes me want to dance. Now I'm ready to go out, visit with friends, and have a splendid evening. Thanks Karla for giving voice to the nappers of the world. Nappers Unite. Now, wouldn't it be funny if we added a powernapsrule track at one of the upcoming unconferences? It's 5:50p.m. Jan2nd 2010 and the ding of a tweet alert just woke me up. It was @HRMargo suggesting updating this post. What a fun idea! I'm going to take her up on that. Anytime I have an incredibly good nap I'm going to write about it here. You're invited to do the same, of course. I think I napped for 2 hours and dreamed of conversations with friends. I awoke to Diablo under the covers snuggled behind my knees, Chanel in the crook of my elbow and Nena at my feet. All of us happy for the warmth of the fireplace on a lazy Saturday afternoon. Here's to #powernapsrule! Paris22 – You sound cranky like you need a nap. After burning the candle at both ends this week, I need to take a well-deserved #powernap. According to your study, 66% of workplaces don't allow time for powernaps. Yet, wouldn't we all be more productive if we could take a siesta? I'm not talking about having a snore-fest, rather a simple room, with a cozy cot where a person could shut their eyes for 10 to 15 minutes. Just think of how much more productive we would be if we weren't over tired. Did you know that sleep deprivation causes more car accidents than drunk drivers? It's true. While I don't have the most recent statistics, people who are tired make more errors in judgement than people who are refreshed. Therefore, Karla, I want to lobby congress for a #powernaprules stipulation in workplace policy. There has to be a think tank somewhere that would support this. Ok, lobbying congress might be taking the issue too far, and surely I jest. But, with that said, I believe with all my heart that if employees were allowed to take breaks every 5-6 hours they would feel better, and be better team players. There's a stigma about napping at work. Now, I'm not advocating narcoleptic nods behind your computer screen…all I asking for is the ability to shut my eyes during my regularly scheduled breaks without being judged. No, I'm not a sleepy slacker. Nor, do I take naps during the work week. Often, when I do I wake up even more tired, but I think this is because there's such a taboo against napping. It's Sunday. I'm about to take my powernap now. As promised, I am making my weekly journal entry on your blog on behalf of the #powernaps rule contingency. 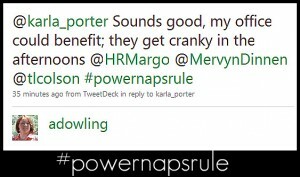 @Margo You #powernapsrule passion is undeniable. Lots of places that have hourly employees have rules like a 15 minute break for every 4 hours worked. Salaried employees really shouldn't have anyone breathing down their necks and ought to be able to take breaks when they need them considering they probably put in at least 45 hours per week but most likely 50-55. I want to make a suggestion. Cots are nice but they take up a lot of room. I'm suggesting wall hooks to tend hammocks. When it's break time just tend your hammock and take it down when you are done. That way it's sanitary too and you don't have to worry about wiping down the surface like with gym equipment. Also, you don't have beds all over the place.. I slept in a hammock for years in Mexico and one of the huge benefits is there is no messy bed to make. Who knew that on October 24, 2009 you'd write a post that still has legs today. If I were a smart woman, I'd update the data and write about it myself. Yes, I'm just that passionate about the power of taking powernaps. Today, it is Sunday, and I took my siesta. It was glorious. After a day of guitar shopping with my Son, Noah I was tired. After an hour of rest, I feel completely refreshed and renewed. Tonight the Grammys are on, and I'll be watching them with friends. If I hadn't had my powernapsrule today, I would not feel as rested and ready to interact. Thank you Karla for my weekly nap journal. I enjoy checking in with this topic as regularly as I can. One day, I will establish a powernaps rule policy in a progressive office somewhere. Take care my friend. Thanks for updating. I took such a profoundly deep REM nap I didn't know what country I was in when I awoke. That's the kind of sleep I like. It's like having a a whole other life.